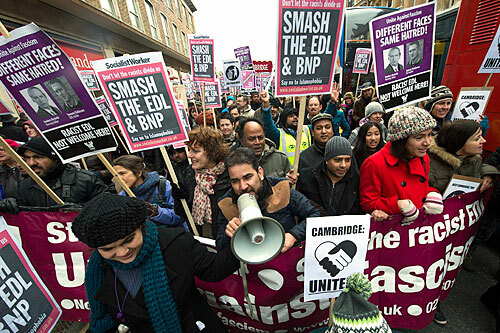 On the 23rd February, myself and three comrades travelled down to Cambridge to oppose the EDL demo in the city centre. The fascists were using the proposal for a ‘super-mosque’ on Mill Road as an excuse to travel to Cambridge, spreading their messages of hate and attempting to divide the community. Thankfully, their turnout was pathetic and their protest was hardly worth the police officers who facilitated it. We gathered at Petersfield at midday for a rally, with various speeches from Cambridge councillors, a member of We Are Norwich, a member of the Muslim Council of Cambridge and Weyman Bennett, amongst others. Local MP Julian Heppert reinforced the message of the day; ”I want to make it very clear that they’re not welcome here.” We stopped for a few minutes during the call for prayer from our Muslim comrades, and then we started our march. Our march ended back at Petersfield, where we were provided with free food and drinks by the Mosque from Mill Road. The police marched the EDL back to the train station in a moving kettle, so they could scuttle back to the various places round the country they’d come from. Only four days before the EDL protest, Marine Le Pen had spoken at Cambridge Union and she was met with a protest of several hundred students, trade unionists and locals outside the building. The protesters denounced Cambridge Union for giving yet another fascist a platform, and the resistance resulted in Le Pen having to be smuggled out of a side entrance by bodyguards. Whilst the feeling around each anti-fascist protest was different and attracted different groups, we must make it clear that a fascist in a suit and a fascist in a tracksuit are one of the same – we build against fascists wherever they stand and however they present themselves. This entry was posted on Mar 7, 2013 by leicestersocialistworkersparty in Socialism, Uncategorized and tagged communism, left-wing, leicester, politics, socialism, socialist, socialists.